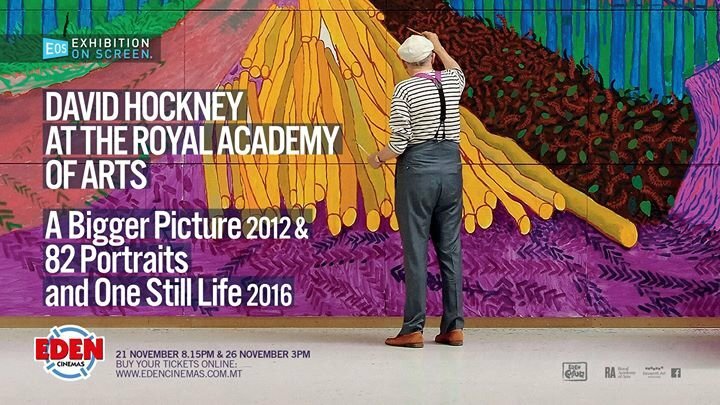 As part of its Arts on Screen series, Eden Cinemas brings you David Hockney at the Royal Academy of Arts: A Bigger Picture 2012 & 82 Portraits and One Still Life 2016. The on-screen exhibition, will be shown in Eden Cinemas’ theatre on Tuesday 21st November at 8.15pm and Sunday 26th November at 3pm. Watching David Hockney at the Royal Academy of Arts on Eden Cinemas’ multipurpose theatre will be a truly immersive experience, offering a unique opportunity to witness never-before-seen interviews with one of the world’s favourite living artists and behind the scene footage to Hockney’s wildly popular exhibitions at the Royal Academy of Arts. Tickets are available at €12.